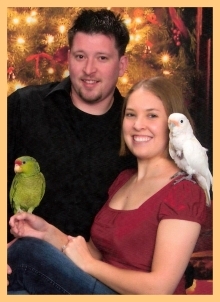 We Love Pet Birds and Parrots! 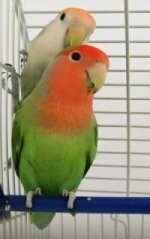 There’s nothing like coming home to a pet that can say “Hello” or “I love you.” Pet birds are preferred by many people. And the truth is, once you’ve had a bird as a part of your life, it’s difficult to imagine coming home to any other pet. Birds are intelligent, quirky, and mischievous–all around amazing creatures. Are you a bird lover too? Or do you just want to know what all the fuss is about? Every parrot has the capacity to be a great, lovable companion. Unfortunately, this doesn’t always come easy. If you are having trouble with your parrot and you’re looking for answers, you should start with our Easy Parrot Training article. The Red Bellied Parrot is a fun and cuddly pet bird. Find information, videos, gifts, and stories about this fascinating species. An Easy Parrot Characteristics Comparison Chart! 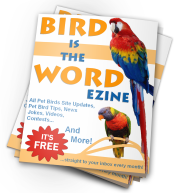 All pet birds are different, and this is an easy way to find the right one for you! All conure parrot species are small bundles of energy and fun. Find information, videos, gifts, and stories about this fascinating species. The Senegal Parrot is a popular pet because it is a small parrot with the exuberant personality of a large parrot. Find information, videos, gifts, and stories about this fascinating species. The Eclectus Parrot is an intelligent and active pet bird. Find information, videos, gifts, and stories about this fascinating species. The Cockatiel is the second most popular pet bird in the world and is a loyal friend and a playful companion. Find information, videos, gifts, and stories about this fascinating species. Make sure you get the best bird cages for your feathery friends! Make sure you get the best small bird cages for your feathery friends! Make sure you get the best canary or finch cage for your feathery friend! Make sure you get the best parrot cages for your feathery friends! Make sure you get the best large parrot cage for your feathery friend! Make sure you get the best parrot diet for your feathery friend! Make sure you get the best parrot food for your feathery friend! Make sure you get the best Cockatoo and Macaw food for your feathery friends! Make sure you get the best small bird or parakeet food for your feathery friend! Make sure you get the best canary or finch food for your feathery friend! How to convert your bird from parrot seed to pellets. A simple pet bird supplies checklist for your new feathery friend! A simple parrot supplies checklist for your new feathery friend! The cockatoo parrot species are extremely cuddly, but also very needy. Find information, videos, gifts, and stories about this fascinating species. The Caique parrot is an energetic and comical friend. Find information, videos, gifts, and stories about this fascinating species. The Poicephalus parrots are a playful group of pet birds. Find information, videos, gifts, and stories about this fascinating species. The Hawk Headed parrot is a unique and loyal friend. Find information, videos, gifts, and stories about this fascinating species. Finding the best pet bird is not an easy task, but this simple quiz will show you what bird is best for you! The funniest Cockatoo video page that has all the videos you want to see! Choosing a pet bird can be a lot of fun and it’s easy with this short quiz!